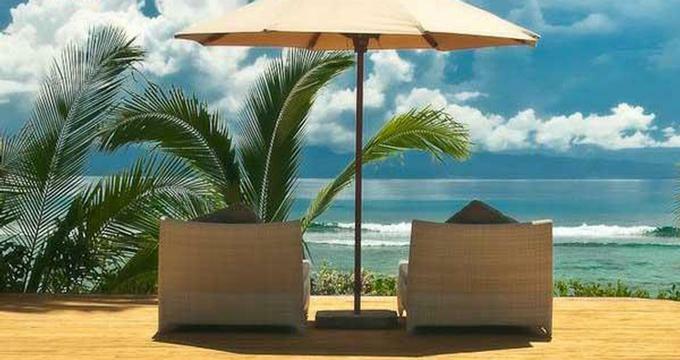 When you stay at Taveuni Palms in Fiji, you never have to see another guest unless you want to. You will be accommodated in a stunning villa situated on its own stretch of private beach, complete with a pool and a staff to help you will all your vacation requests. Whether you want a private dinner under the stars, help with unpacking or a luxurious bath, there will always be someone available to make sure that you don't have to lift a finger. Your master bedroom will be air conditioned, although you may decide to simply open the windows and enjoy the soothing ocean air. The bathroom has a large outdoor shower, perfect for rinsing off the sand when you come back in from the beach. Relax and enjoy the scenery from a plush daybed sofa, listen to your music mix or curl up with a book. The entertainment center includes an iPod pre-loaded with 1,000 songs. On some days, a pod of dolphins may swim by and play in the waters in front of your villa. Treatments at the spa are a delight for the senses. Therapists utilize tropical oils to relax and pamper you on the deck of your villa while you listen to the sounds of the birds and the ocean. Most of the food served on the island is organically grown on-property. You can sample fresh island fish dishes and spices like ginger and chillies. Your personal Chef will ask you about your flavor preferences and prepare custom menus for the duration of your stay. You'll be able to choose from diverse dining locations on the island. If you want to propose, the staff will recommend the best scenic spot. The island is especially popular with honeymooners who want to spend a week in paradise, away from daily routines, getting pampered by luxury service and enjoying an array of activities such as snorkeling, scuba diving and dolphin watching. Weddings are very popular with couples who want to elope to the South Pacific. The Director of Romance will make sure that your wedding day is perfect. You can call before you arrive on the island to go over all the details. Villas start at $1,500 per day.